Our holy and God-bearing Father, Bishop Nikolai of blessed memory, was born at dawn on December 23, 1880, on the feast of St. Naum of Ochrid, to pious Serbian Orthodox parents, Dragomir and Katarina Velirnirovich, in the small village of Lelich, only five miles southwest of Valjevo, a city located in the valley of the Povlen Mountains of western Serbia. Because he was born physically weak, this divine child of God was baptized soon after his birth. He was given the name Nikolai, after his familys Krsna Slav (family Patron Saint), Sveti Nikola (St. Nicholas of Myra, Lycia; honored December 6th). Nikola was the first-born of Dragomir and Katarina, who had eight other children, all of whom unfortunately perished later during World War II. The baptism of young Nikola took place in Chelije Monastery; and was performed by beloved Pop Andrija (Fr. Andrew), the parish priest of the Serbian Orthodox Church in Lelich. Nikolas parents were pious farmers who always interrupted their work schedule for daily prayer, which included keeping the yearly fasting routine as well as the liturgical cycle of the Orthodox Church. His mother Katarina, quite pious and truly a holy woman, provided Nikola with his first lessons about God, Jesus Christ, the lives of the saints, and the holy days of the Church year. Often Nikola was seen being led by the hand of his mother to Chelije Monastery—a walk of three miles—for prayer and Holy Communion. Later Nikola (as Bishop Nikolai) recalled these lessons on God and walks with my mother as being some of the most influential experiences in his life. He wrote of them in an autobiographical poem, written in Serbian, entitled Prayers of a Captive in Prison (1952). Nikolas formal education began in Chelije Monastery; dedicated to the Holy Archangels Michael and Gabriel, where his father Dragomir had hoped he would learn to read the call to service from the government, in order to be a leading man and protector of his village Lelich. Pop Andrija taught mali Nikola (Little Nicky), as he was known in Lelich, his first lessons in reading, writing and mathematics. Besides these lessons, Fr. Andrew, being Nikolas spiritual father, taught him about the Scriptures and the teachings of the early Fathers of the Church, as well as the religio-national traditions of his Serbian heritage. This latter education was inspiring to Little Nicky from the very beginning. He demonstrated, even as a youngster, a tremendously penetrating mind and a zeal for learning. Quite often during summer breaks Nikola would climb the bell tower of the catholicon (main church) of Chelije Monastery and hide there all day long, occupying himself with prayer and the reading of books. Thus, due to the influence of his mother Katarina and the lessons of beloved Pop Andrija, Nikola seemed headed for far more than just being a leading citizen of his small village of Lelich. After finishing sixth grade in grammar school in Valjevo, Nikola petitioned for entrance into the Military Academy. However, he could not pass the physical exam, as he was, in the words of the physical fitness commission, too small, not having large enough shoulders and a frame strong enough for such activities. This was certainly the divine will of our Heavenly Father, Who desired that Nikola travel on another path—to be a soldier of the Heavenly Kingdom and not of the earthly one. Immediately thereafter, Nikola applied for entrance into the Seminary of St. Sava in Belgrade, where he was accepted to begin studies as a seminarian. Besides studying the usual subjects, Nikola began reading the significant texts of the most famous writers of western and eastern European culture: Shakespeare, Voltaire, Nietzsche, Marx, Pushkin, Tolstoy, Dostoevsky; and others. His favorite author was without a doubt the Montenegrin Peter Njegosh, whose writings he had been reading since his early school days in Valjevo. His final examination for seminary studies was a discourse on the poetry and thought of Njegosh. This discussion, held in 1902 in Rakovica Monastery, located just ten miles south of Belgrade, amazed not only his fellow students, but even his professors and instructors as well. Life was difficult for Nikola during his years as a seminarian in Belgrade. Due to his poor eating habits and the terrible living conditions of the Seminarys housing facilities, Nikola contracted scrofulosis, a disease affecting the bodys glands. After his seminary days, Nikola taught for a short while in the villages of Drachich and Leskovac, as well as in Valjevo. In Valjevo, he befriended Fr. Sava Popovich, whom he helped in parish activities and from whom he learned the ropes of being involved with the faithful on an everyday basis. During summer breaks, at the advice of his doctor, Nikola spent time on the sea coast. It was during these resting times that he wrote the life of Bokel the Montenegrin and Dalmatian. Also at this time, Nikola founded a newspaper, Chrischanskj Vesnik (Christian News), in which appeared his first writings and articles. In 1905, due to his astute knowledge and evangelical activities, Nikola was chosen, along with several other students, to continue studies in Russia or Western Europe. Nikola chose to study in Europe, in the Old Roman Catholic Theological Faculty at the University of Berne, Switzerland. Besides studies in Berne, Nikola studied in Germany, England, and later in Russia. He was exposed to the finest education Western Europe had to offer. He even became knowledgeable in the spiritual and philosophical books of ancient India. This learning made Nikola into a Renaissance man, whose erudition and profundity of thought were considered by everyone as both a wellspring of knowledge and a unique treasury of wisdom and spirituality. In 1908, Nikola received his Doctorate in Theology in Berne, with the dissertation entitled Faith in the Resurrection of Christ as the Foundation of the Dogmas of the Apostolic Church. This original work was written in German, published in Switzerland, and later translated into Serbian. In the following year, 1909, this veritable genius, at age twenty-nine, prepared his Doctorate in Philosophy at Oxford, England; and during the summer of that same year, in Geneva, Switzerland, Nikola wrote his second doctoral dissertation, entitled The Philosophy of Berkeley, in French. In the fall of 1909, Nikola returned home from Europe and became grievously ill with dysentery. This illness changed his life. Like the great theologian of the early Church, St. Gregory of Nazianzus (+390; honored January 25th and 30th), whose life was also dramatically changed due to a personal difficulty , Nikola decided to apply all his gifts and talents in service to God and His holy Orthodox Church. Lying in the hospital for over two months, Nikola prayed in his heart, saying, If service to the Lord is needed, He will save me. He then vowed that if he were returned to health he would become a monk and serve God’s people in His Church. Thus as a Doctor in Theology and Philosophy, Nikola became the lowly monk Nikolai. After his tonsure into the monastic ranks, Monk Nikoli was ordained to the priesthood on the same day, December 20, 1909, in Rakovica Monastery. Hieromonk Nikolai now placed his entire being—his knowledge and all his talents—in the service of God and His Serbian Orthodox people; and within a short period of time, pious Fr. Nikolai was elevated to the rank of Archimandrite. After his tonsure and ordination, Archimandrite Nikolai was chosen to be a teacher in the Seminary of St. Sava in Belgrade. However, it was discovered that he had not completed the final two years of gymnasium (grammar school), the seventh and eighth grades; he had to take a test in order to fulfill these requirements which would in turn validate his status as a teacher. The commission before whom Fr. Nikolai spoke was amazed with his wealth of insight. According to the words of one of its members, Listening to his discourse on Christ, we were astonished, as no one could ask him one question or even say one word in reply. Yet it was decided that before Fr. Nikolai could become a teacher in the Seminary; he would be sent, with the blessing of Metropolitan Dimitriji of Serbia, to Russia. Spending over a year in Russia, Archimandrite Nikolai learned of the passionate Russian spirit and of the rich Orthodox soul of the peasantry. It was during this time that Blessed Nikolai wrote his first great work—The Religion of Njegosh. One of the contemporary critics said of this work that from a religious-philosophical point of view, or a religiously critical point of view, the young seminary professor [Fr. Nikolai] is no less interesting than the Bishop of Cetinje [Njegosh]. Returning to Belgrade as a seminary professor, Nikolai published, in 1912, an anthology of homilies entitled Besede Pod Gorom (Sermons at the Foot of the Mount). Explaining the title, the humble Nikolai wrote, Christ spoke on the Mount; I dare to speak only at the foot of the Mount. In 1914 Fr. Nikolai wrote the book Iznad Greha i Smrti (Beyond Sin and Death), a writing of immense profundity yet with the ability to reach the soul of the common person. Nikolai was most inspiring to his students. Under his spiritual influence and guidance, many went on to become monks, clergy and theologians. One of them, Justin Popovich, a spiritual disciple of Fr. Nikolai, became one of the greatest theologians in the history of the Serbian Orthodox Church (commemorated March 25th). Thus, besides teaching philosophy, logic, history, and foreign languages in Belgrade, Rev. Dr. Nikolai Velimirovich was fast becoming a great Serbian literary figure as well as a beloved spiritual pastor; soon he would become a well-respected international figure as well. With the outbreak of World War I in the summer of 1914, the entire Balkan peninsula was thrown into turmoil. The imperiled Serbian nation badly needed a leader to help them survive this international crisis. To this end, Archimandrite Nikolai was called to embark upon an official diplomatic mission to England in order to obtain support from the British government for the suffering Serbian people. Having received a doctorate from Oxford, Nikolai was received with honor and dignity by the British authorities. His political astuteness was revealed in several lectures and homilies delivered in England, which not only invoked a profound concern for the suppressed Serbs, but also addressed the issue of world peace and the methods to attain such a political ideal. Besides receiving British support for the Serbs, Nikolai was also personally awarded a Doctorate of Divinity—honoris causa—from Cambridge University. His short tracts, The Lord’s Commandments and Meditations on the Lord’s Prayer, electrified the Church of England, and also shattered many false conceptions of what the Orthodox Faith entailed. In the late summer of 1915, Archimandrite Nikolai continued his war mission by traveling across the Atlantic Ocean to New York City; America. His mission was to rally the emigrant Serbs, Croats, and Slovenes against the Austrian government, for the majority of them had fled to America. His mission was quite successful, as America sent over 20,000 freedom-loving Slavic volunteers—called the Third Army of Bishop Nikolai, most of whom fought on the Salonican Front—and hundreds of thousands of dollars worth of aid to their suffering brothers and sisters in the homeland. This trip was also quite revelatory for Nikolai: in a dream he received a message from an Angel of the Lord, who revealed to him that he would someday return to America and help organize the fledgling Serbian Orthodox communities into an American Serbian Diocese totally united with the Dioceses in the motherland. In early 1916 Nikolai returned to his beloved England, where he decided to sojourn until the end of the war. He continued his literary activities by writing several articles and books: The Religious Spirit of the Slays (1916, sent to the soldiers in the homeland); Serbia in Light and Darkness (1916); The Serbian Soul, The Agony of the Church, The Serbian Orthodox Church, and The Spiritual Rebirth of Europe (all in 1917). Oriented towards a British audience, these essays and books appealed to their sense of justice for suffering Serbia. In particular, The Spiritual Rebirth of Europe was of great interest to the Anglicans, for it promoted the possibility of a return of the Anglican Church to her rightful mother, the Orthodox Church. As a result of his academic excellence, Nikolai received another Honorary Doctorate of Divinity; in 1919, from the University of Glasgow in Scotland. Feeling tremendously homesick, the patriotic Nikolai returned to Belgrade toward the end of the war. He then became involved in the formation of the new Yugoslav state as the interpreter for the then President of the government Nikola Pashich. Yet Nikolai felt that there was something missing in his life. He wanted to be involved with his suffering people on a more daily basis. The fulfillment of this yearning came quickly on March 12, 1919, the Holy Synod of the Serbian Orthodox Church selected Fr. Nikolai, at age 39, as the new Bishop of Zhicha, the historical seat of the First Archbishopric of Serbia. During his episcopal consecration, Blessed Nikolai cried as a newborn babe in the Lord. Thus after four years of seeking support from England and America in behalf of Serbia, Bishop Nikolai was now ready to personally help in healing the war-torn hearts and souls of his beloved Serbian people. For two years (1919-1921), Bishop Nikolai spiritually soothed pious Serbs not only in the Diocese of Zhicha, but also throughout newly formed Yugoslavia. Like the Lord and Savior Jesus Christ, Archpastor Nikolai healed the sick, set free the spiritually captive and preached salvation to these humble souls. In 1921, Bishop Nikolai was transferred to the Diocese of Ochrid and Bitola. This was done to facilitate the union of the Serbian and Macedonian Churches which occurred as a result of the formation of the Kingdom of Yugoslavia. Blessed Father Nikolai, always a man of unity, peacefully engaged in the union of the Serbs and Macedonians of these regions. 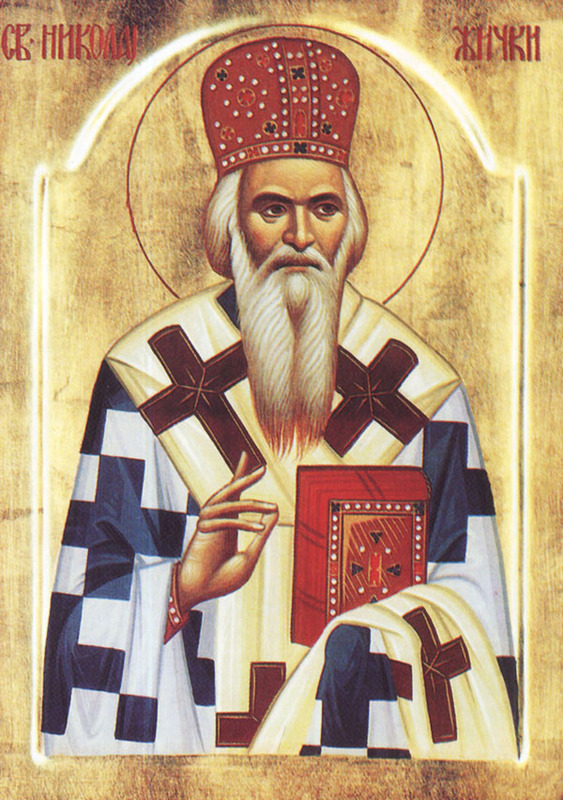 Besides sowing seeds of unity in his diocese, Nikolai also visited Athens, Constantinople, and the Holy Mountain, where he was received as a unifier of all Orthodox in the bond of love for Christ and His Church. During this time Nikolai wrote two books: Rechi O Svechoveku (Orations on the Universal Man, 1920) and Molitve Na Jezeru (Prayers at the Lake, 1921). This latter work, written during his resting periods at Lake Ochrid, was in poetic-prose style, so deep and profound, similar in spirituality to the great Psalms of David. Yet Bishop Nikolai was not destined to stay in his homeland. Like a beacon set upon a hill, his divine radiance was seen from afar, as he was invited to deliver lectures at various universities and Anglican Churches in America. At first, the Royal Government of the Kingdom of Yugoslavia as well as the Holy Synod of Bishops refused these requests for Bishop Nikolai; but the invitations kept coming, so that in the end they both resolved to send beloved Nikolai to America for a second time. On June 24, 1921, Blessed Bishop Nikolai arrived, by the grace of God, in New York City; He had three immediate goals while in America: 1) to deliver lectures and homilies in universities and churches with the purpose of presenting World War I from the Eastern European viewpoint; 2) to collect funds for the setting up of orphanages in Serbia for those poor children who lost parents and relatives during World War I; and 3) to visit many Serbian Orthodox communities in order to thank them for their patriotic war efforts, along with making a report on the possibility of creating an American Serbian Diocese of the Serbian Orthodox Church. The brilliant Bishop Nikolai was successful in all three phases of his mission. He delivered approximately 150 lectures and homilies in the following three months. He spoke at a variety of places including Columbia University in New York City, various Serbian communities, and even the African-American Congregation of St. Philip in Harlem, New York, to over 1,500 parishioners. Wherever he spoke concerning the past World War, his message was clear. Do not blame the (Eastern) European peasant for the war, he proposed, but rather, look to the artificially created intellectual class of the European university system. He wrote, The European peasant is a noble spirit, but it is the intellectuals in charge of the peasants who are on the wrong track. Nikolai said that if these conditions in Western Europe continued, a second world war was likely to happen. And how right he was. One of his most enlightening sermons was delivered on the Sunday after Ascension, 1921, in the Episcopalian Cathedral of St. John the Divine in New York City, entitled The Stone which the Builders Rejected (Matt. 21:42), in which he called for a return on the part of Western Europe to the true source and rock of their entire culture and civilization, to the Lord and Savior Jesus Christ, the Way, the Truth, and the Life. Nikolai also proposed that America, such a rich multi-national country, could possibly hold high the torch of hope for all of humankind. The world has become small, but it waits to be proclaimed a united being. Europe has discovered the world. Can America organize it? proclaimed Nikolai time and time again, with the hope that America would lead the way to a peaceful and just world for all. As a result of these speeches, Nikolai was called a second Isaiah and a New Chrysostom of our times; furthermore, his activities helped in obtaining acceptance of Yugoslavia into the League of Nations. Concerning the development of orphanages for suffering Serbians both in the United States and Yugoslavia, Nikolai was motivated by the commandments of the Lord Jesus Christ: Let the children come unto Me, and do not hinder them; for of such is the Kingdom of Heaven…. Take heed that ye despise not one of these little ones; for I say unto you, That in heaven their angels do always behold the face of my Father which is in heaven (Mart. 18:10). Come unto me, all ye that labor and are heavy laden, and I will give you rest… For my yoke is easy and my burden is light (Mart. 11:28, 30). For I was an hungered, and ye gave me meat: I was thirsty and ye gave me drink: I was a stranger and ye took me in: Naked, and ye clothed me. I was sick, and ye visited me: I was in prison, and ye came unto me…. Verily.., inasmuch as ye have done it unto one of the least of these my brethren, ye have done it unto me (Matt. 25:35-36, 40). Nikolai felt the pain of the loss of beloved ones so acutely that he often broke into tears upon visiting orphans and the poorest of the poor in his homeland. Prior to coming to America he set up an orphanage in Bitola, placing at its head the exiled Abbess Anna—previously known as the social worker Nada Adjichin Vrachevshina Monastery. To the poor children in Yugoslavia, Bishop Nikolai became known as Deda Vladika (Grandfather Bishop), as one who really cared and practiced what he preached to alleviate their plight and difficulties. As head of the Council of Serbian Child Welfare in Belgrade, Nikolai, while in America, secured thousands of dollars for the cause of taking care of these little ones. With this money he personally organized and supervised orphanages in Kraljevo, Chachak, Gornji Milanovac and Kragujevac, where over 600 poor children were granted the love of Christ in personal social action. Finally, concerning the creation of an American Serbian Diocese of the Serbian Orthodox Church, Bishop Nikolai wrote a Paschal Epistle in 1921 to all the Serbian Orthodox parishes in America. Blessed Nikolai extended greetings from the re-established Patriarchate of Serbia, from His Holiness Dimitrije, Patriarch of the Serbian Orthodox Church. He also outlined plans for the establishment of a Serbian Diocese in America. Nikolai, being the first Serbian hierarch ever to travel in America, was greeted with utmost respect upon visiting the Serbian communities. The problems of the Serbs in America were many: they were often pastored by Russian priests who did not understand their language; there were no monasteries to lead the people in the spiritual life; there was no seminary for education of clergy and the faithful; mixed marriages created confusion among the faithful; schisms in other Orthodox jurisdictions created a general mistrust of leadership among all Orthodox in America; Protestant and Roman Catholic church practices, as well as American secularism, were creeping into the life of the churches; and, above all, a lack of organization among the Serbian parishes made the Serbs feel like an island in a great ocean. In the words of a letter of a Pittsburgh clergymen sent to the Patriarch in early 1921, the Serbs in America were like bees in a hive without a queen bee. Bishop Nikolai returned to Belgrade on June 16, 1921, after six months of missionary activities in America. When he left, the American Serbians mourned the loss; but they all hoped that he would return as their new Bishop of the American Diocese. Yet this was not the will of the Lord. Ten days later, on June 26th, he gave his report on the American situation in a session of the Synod of Bishops held in Sremski Karlovac; and on September 21st, Metropolitan Varnava nominated Bishop Nikolai to assume the duties of Bishop of America, with Archimandrite Mardariji Uskokovich of Rakovica Monastery (south of Belgrade) as his administrative assistant. This decision upset many pious Orthodox Serbs in the homeland, as none of them—bishops, clergy, monastics, and faithful—were ready to relinquish their beloved Serbian Chrysostom and Evangelical Leader to the American Serbs. Somewhat frustrated over this situation, in January 1922, Bishop Nikolai went on a pilgrimage to the Holy Land, then traveled to the Holy Mountain, to Hilandar Monastery, to spend Pascha with the monks there. This sojourn was a spiritual necessity for Bishop Nikolai, as he retreated from the pressing problems and sought counsel from his Heavenly Father. Upon his return fur the gathering of the Synod of Bishops, Nikolai was convinced that the American situation needed a full-time bishop to carry out the ecclesiastical plans which the Angel of the Lord had previously revealed to him in his dream. Thus, he himself nominated Archimandrite Mardarije Uskokovich to be the future first permanent Bishop of the Serbian Orthodox Church in America. This nomination was confirmed by the entire Synod of Bishops, and on October 18, 1923, Archimandrite Mardarije was appointed the sole administrator of the Serbian Church in America. This decision was not only a spiritual blessing for Bishop Nikolai himself—relieving him of some of the many duties forced upon him—but it was also a divine blessing for the pious Serbs in the homeland. Nikolai was now able to devote himself fully to writing inspiring works as well as pastoring his faithful to be more fully immersed in the love of Jesus Christ and His Church. In 1923, Nikolai wrote Nove Besede Pod Gorm (New Sermons at the Foot of the Mount), Misli o Dobru i Zlu (Thoughts on Good and Evil), and a lengthy work entitled, Omilije na Nedeljna i Praznichna Evandjelja (Homilies on the Sunday and Festal Gospels). Besides writing, Nikolai began a popular religious movement, later affectionately called Bogomoljacki Pokret (Movement of God-Prayers). The venerable Bishops disciples loved to gather at his episcopal residence to sing the very moving and edifying songs he had written. Praising the Lord in their mother tongue was a joy and delight to these zealous Orthodox Serbs. The once-maligned Serbian Christians experienced in Nikolai an evangelical freshness which renewed their spirits after the war and which allowed them to once again be fully immersed in the love of Jesus. By praying to the Lord in the vernacular Serbian, these Serbs desirous of a fuller Christian life were able to be built up into a people of God with the God-praising Nikolai leading the way. There were many priests who were jealous of Nikolais Bogomoljacki Pokret, but as they began to experience the spiritual growth among their parishioners, they slowly supported this prayer movement. These Orthodox Serbian zealots—by their constant reading of the Scriptures, singing of spiritual songs, quickness of prayer, travels from monastery to monastery, regular confession of their sins, keeping of the fasts, and frequent communing of the precious Body and Blood of Jesus Christ—began to slowly transform the clergy of the various Serbian Dioceses. Bishop Nikolai, a master at pastoring his people, allowed his passionate God-seekers to lead the way in renewing the Serbian Church. Through this prayer movement, monasticism was revitalized as well as the study of theology, as was clearly evidenced, for example, in the life of the great theologian and ascetic, Archimandrite Justin Popovich of Blessed Memory. In 1927, at the invitation of the American Yugoslav Society, the Institute of Politics in Williamstown, Massachusetts, and the Carnegie Endowment for International Peace, Bishop Nikolai once again traveled to America for his third visit. He spent only three months in America, speaking at various universities and churches as well as inquiring into the progress of the St. Sava Serbian Orthodox Monastery in Libertyville, Illinois, under the direction of newly consecrated Bishop Mardarije. On his way home to Serbia, Nikolai stopped in London where he stayed for two weeks, prophesying that an impending catastrophe was threatening Europe. The Prophet Nikolai, a man rooted in the present with a clear vision of the future, was a voice crying in the wilderness to a people in search of hope for a peaceful future. His message was clear: Repent, for the Kingdom of God is at hand!. Returning to Ochrid, the venerable bishop began writing once again. It seemed as though his sojourns in foreign lands filled his mind and heart—his total being—with restless divine thoughts of the promised Eternal Paradise; and the only way to relieve himself of these majestic longings was to write of them. In 1928 he wrote Vera Obrazovanih Ljudi (The Faith of Educated People), Rat i Biblija (War and the Bible) and Ochridski Prolog (The Prologue of Ochrid). This latter book, over 1,000 pages, was patterned after ancient hagiographical literature which included both brief Lives and edifying incidents from the lives of holy men and women, as well as ordinary sinners. Also entitled Zhitije Svetih (The Lives of the Saints), this text was based upon the daily calendar of Orthodox Saints. Translated into English in 1985, The Prologue of Ochrid has become a spiritual classic to all Christians living in the West. The Bishop of Montenegro, Amphilocije Radovich, a disciple of Nikolai, once said that the only two books one needs to digest and put into practice to obtain salvation are the Bible and The Prologue of Ochrid. In the town of Bitola in Bishop Nikolais diocese was the Serbian Seminary of St. John the Theologian. From 1929 to 1934, one of the theology instructors there was the young Hieromonk John Maximovitch, the future Archbishop John. Bishop Nikolai valued and loved Fr. John, and exerted a beneficial influence upon him. More than once he was heard to say, If you wish to see a living saint, go to Bitola to Fr. John. The lives of Bishop Nikolai and Fr. John would one day parallel each other: both of them would spend the last years of their lives in America and die there, and both would be canonized as saints. In early 1930, Bishop Nikolai participated in the Pan-Orthodox Conference held at Vatopedi Monastery on the Holy Mountain. It can be said that Bishop Nikolai was the Voice of Orthodoxy during this time, as he was not only able to lead pious Orthodox Greeks, Serbs, Russians, and Bulgarians to transcend any nationalistic tendencies which might threaten the bond of love and unity of spirit among them; but also, perhaps more importantly, the venerable Bishop, by his ability to abstract the true Holy Orthodox Tradition from all local Orthodox Church traditions, was able to present to Western Christians in a precise and comprehensive manner the true and eternal faith of the One, Holy, Catholic and Apostolic Church. Prior to World War II, Nikolai wrote Simvoli i Signali (Symbols and Signs, 1932) and Nomologija (Nomology, i.e., The Science of Law, 1940); and in 1937 until the outbreak of war in 1941, Nikolai began a compilation of his letters entitled Misionarska Pisma (Missionary Letters). This anthology of hundreds of letters witnessed to the amazing evangelical activity of Bishop Nikolai, as he was uniquely attuned to the spiritual crises of these perilous times. while the confessor Nikolai moved on to America for the fourth and final time. After recuperating from an aching back and leg problems, the exiled Bishop began lecturing, as usual, in various educational institutions. In June 1946, he was awarded for his academic excellence his final Doctorate of Sacred Theology from Columbia University. In all, Bishop Nikolai obtained five doctorates. From 1946 to 1949, Venerable Nikolai, always loyal to his Serbian people, taught at the St. Sava Seminary in Libertyville, Illinois. Realizing the need for Amencan-born Serbians to have an Orthodox catechism in English, he published The Faith of the Saints (1949). In 1950, he wrote an essay on Orthodox mysticism in English, The Universe as Signs and Symbols and a book in Serbian entitled, Zemlja Nedodjia (The Unattainable Land). In 1951, his last book written while teaching at St. Sava’s was, fittingly, The Life of St. Sava. According to the words of the distinguished professor Dr. Veselin Kesich, this book reveals something about [Bishop Nikolai] himself in his meditation on the end of St. Sava’s Life: Sava withdrew to his House of Silence in Studenica and offered a prayer to God to let him die in a foreign country Why did he pray for this? Bishop Nikolai considers several reasons: Sava’s protest against political disorder at home, his appeal to the conscience of his people, and his conviction that he would work for their salvation from the outside. These three reasons probably influenced the Bishops decision to come to America and not to return to Yugoslavia after the war. In 1951, beloved Bishop Nikolai moved to St. Tikhons Russian Orthodox Monastery in South Canaan, Pennsylvania. Here he spent the last five years of his earthly life as a professor, dean, and eventually rector of the Seminary. Being all things to all people, Nikolai published articles in Russian for the God-seekers at St. Tikhons. His ease and facility with languages was amazing to all. Nikolai could read, write, and speak fluently seven different languages. Besides his activities at St. Tikhons, Bishop Nikolai lectured at St. Vladimirs Seminary in Crestwood, New York, as well as at the Russian Orthodox Seminary and Monastery of the Holy Trinity in Jordanville, New York. Yet he did not forget his Serbian flock, as he published, in 1952, Zhetve Gospodnje (The Harvests of the Lord) and Kasijana (Cassiana), a story of a penitent. In 1953, he wrote Divan (Conversations), a book on the Bogomoljci and their miracles. His final book, Jedini Chovekoljubac (The Only Love of Mankind) was published posthumously in 1958. Bishop Nikolais final undertaking was the Serbian Bible Institute, which published a series of seven short tracts on various theological topics: Christ Died for Us, Meditations on Seven Days, Angels Our Elder Brethren, Seven Petitions, Bible and Power, Missionary Letters, and The Mystery of Touch. Our holy and God-bearing Father Bishop Nikolai of blessed memory fell asleep in the Lord while in prayer during the night between the 17th and 18th of March, 1956, in his humble cell at St. Tikhons Russian Orthodox Seminary; He was 76 years old. He was given an honorable Orthodox Christian burial service in St. Sava Serbian Orthodox Cathedral in New York City; as pious Christians from all parts of the world came to hear eulogies in honor of one of the greatest hierarchs of the entire Orthodox Church in the twentieth century. From New York City his life-giving body was transferred to Libertyville, Illinois, just north of Chicago, to St. Sava Serbian Orthodox Monastery, where more Pomeni (memorial services) were held. He was laid to rest on the south side of the monastery church, on March 27, 1956. Like St. Sava, the Enlightener of Serbia, holy Bishop Nikolai died in a foreign land. Behind the main church of Chelije Monastery in his home village of Lelich, next to the grave of Archimandrite Justin Popovich of blessed memory (+1979), was marked a place for his return to the homeland and the people he so very much loved. Thus, on April 27, 1991, after twenty-five years of repose in the Lord in America, holy Bishop Nikolais body was returned to his homeland in Western Serbia. Pious American Orthodox, particularly many Russian Orthodox, did not forget the blessed Nikolai, as at St. Tikhons Monastery his room was made into a shrine for prayer and meditation. His beloved disciple, Justin Popovich, wrote these words in 1961, at the fifth anniversary of Blessed Nikolais repose in the Lord: Thank you, Lord—in him we have a new Apostle! Thank you, Lord—in him we have a new Evangelist! Thank you, Lord—in him we have a new Confessor! Thank you, Lord—in him we have a new Martyr! Thank you, Lord—in him we have a new Saint! Holy Father Nikolai, the magnificence of your glory shines forth for all to see, as your divine brilliance illumines us all with the superabundant love of Christ the Prince of Peace and Humble Shepherd. Pray to Christ the only Lover of Mankind, O most loving Archshepherd, for us weak and decrepit sinners, that His mind, His brilliance, His care, His energy, His divinity, His strength, His sacrifice, His humility and His resurrected glory may shine within our hearts so that we may in some small way spread His love to the ends of the earth, to Whom belongs glory honor and worship, together with His Unoriginate Father and Life-giving Spirit, now and ever and unto ages of ages. Amen. IN 1951, Bishop Nikolai came to St. Tikhons Seminary first as a professor and finally, with the death of the former Rector, Bishop Jonah, as Rector of the Seminary Here he lived out the last years of his life as an example of humility, as well as an elder to the monastics at St. Tikhons Monastery. To the students of the Seminary, the old Bishop was a loving father figure whom they would never forget. To the laity and faithful of the monastery parish, as well as all who came in contact with the Bishop, he was a hierarch in whom they saw manifest the grace of God. And to all, he was an example of humility. During his years as an educator at St. Tikhons Seminary Bishop Nikolai was seen to be a very unusual person in that his courses were profoundly simple, informal and very warm. His requirements were very basic: he taught, you learned, and he corrected. Perhaps one of the most striking characteristics of his classes was that he taught solely in the English language, at a time when very few courses were taught in that language (and these usually by outside lecturers). This often caused friction with other faculty members, but Bishop Nikolai held fast to his position, for he knew the importance, for the seminarians, of hearing lectures in their native language. Indeed, without this use of English, much of the subtlety of his teachings would have been lost from memory. The use of English extended even to the monastery church, and on most occasions he would preach in that language. Often the parishioners would complain about this, but his answer would be: You have learned and heard enough. Its time for [the seminarians] to learn something. Bishop Nikolais classes, sermons and conversations were always geared to his audience, whether they be students, professors, theologians or simple parishioners, and his vocabulary never extended itself beyond the comprehension of his hearers. For him, class could be any time. Anything said to him could be turned around and assigned a deeper meaning. He would always take examples from conversations in class, at the dinner table, or that which occurred as he walked about the grounds, and would always introduce examples from Holy Scripture, relating them to life at hand. For example, one day in class a student mentioned the fact that it was such a terribly dismal day because of the rain. Bishop Nikolai walked over to the window, looked out, and expounded on the further dimensions of rain, from Noah until the present time: What is rain? It is like Christ Who was also sent by the Father from Heaven to water a thirsty earth. On Sunday, March 18, 1956, Bishop Nikolai fell asleep in the Lord. As related by the late Abbot Afanasy; The Bishop served the Holy Liturgy on Saturday, March 17. Everything was unusually beautiful. Following the service, he went to the monks dining room. After a short talk, with a low bow, three times he humbly muttered, Forgive me, brothers, as he was leaving. This was something special, for he never did that before…. He frequently spoke about wanting to be buried here at St. Tikhons Monastery; since he taught, prayed, and served God here. He had lived among the monks, and had said, ‘It is more natural that I should be buried here. That Sunday morning, the late Fr. Vasily went down to Bishop Nikolais room at the Seminary and upon knocking at the door, received no answer. Opening it, he found the Bishop dead, stretched out on the floor in a kneeling position. In all probability, he had died between seven and eight that morning. The next day, a Memorial Service was served in the Monastery Church for the departed Hierarch by the Serbian Bishop Dionysius. Pray to Christ God to save our souls. Therefore, O venerable Bishop, thou hast attained the crown of eternal life. 1. St. Gregory of Nazianzus life was dramatically changed after the boat in which he was traveling from Athens to Cappadocia (Asia Minor) was wrecked in the Aegean Sea. He then vowed, God desired him to be saved, to place all his talents in service of the Lord Jesus Christ and His Church. 2. This paragraph has been added by the editors from the Prima Vita of Archbishop John Maximovitch, by Fr. Seraphim Rose. 3. Composed by Fr. Daniel Rogich. From The Orthodox Word, No. 171 (1993), pp. 161-183. Reprinted along with the lives of many other Serbian Orthodox Saints in Serbian Patericon, Volume I (Platina, CA: St. Herman Press, 1994). From the book Saints of the Serbian Orthodox Church, by Fr. Daniel Rogich.